Way back in 2009 in Russia, Snowbird Games released Eador: Genesis. 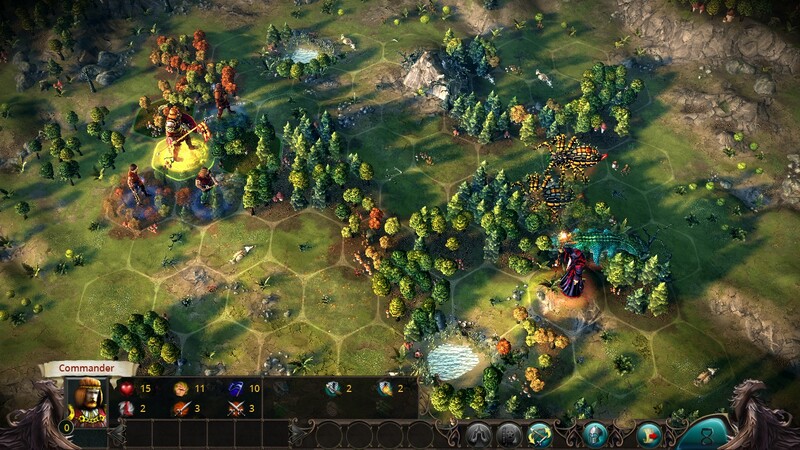 A turn-based strategy game akin to games such as King’s Bounty, Disciples and Heroes of Might and Magic. In the game you would raise an army to conquer entire shards which in this universe, are entire worlds full of unique geography and entire populations. The game also had grand-strategy elements where you would manage your conquered settlements as you see fit. In battle you would take your army on the field in a turn-based fashion and utilise magic and steel to crush your foes. The game was praised for it’s challenging gameplay and deep strategy mechanics, but unfortunately it never found success outside it’s country of origin. Eador: Genesis has recently been released on Good Old Games in English so that it may finally may reach to a wider audience. As well as with the original Eador, Snowbird Games returns to the world of Eador with the remake Eador: Masters of the Broken World. While staying true to the original gameplay with newly updated visuals, Eador: MotBW looks to fight alongside it’s peers on the turn-based battlefield. The universe is made up of countless shards drifting across the Great Nothing. Each shard contains worlds full of people living their lives. The power that holds these shards together is contested in warfare between the Masters. Immortal beings who lead their armies to war so that they may one day obtain this great power. You are one of these Masters and you will decide to either unite the people in harmony and save the world, or begin a campaign of tyranny and oppression. Your goal is to recruit men, manage settlements and fight your enemies until you gain control of every shard. In the campaign you begin with a brief outline of your back-story and choose out of 5 hero types to play as with their own traits and bonuses. After the 1st quest which serves as a good tutorial, you’ll be getting into grips with the gaming mechanics much more. You’ll be exploring provinces in search of raw recruits and resources to begin building an army. You have the choice of befriending the inhabitants or threatening them which will affect the outcome of the story much later. Soon you’ll also need to build a stronghold which will strengthen your domain and improve your army. There are different kinds of magic schools, military training camps and temples you’re able to build which offer a wide range of troop types and bonuses. You’ll also need to work on trade, entertainment for your inhabitants and crafting to obtain better weapons and armour for your men. 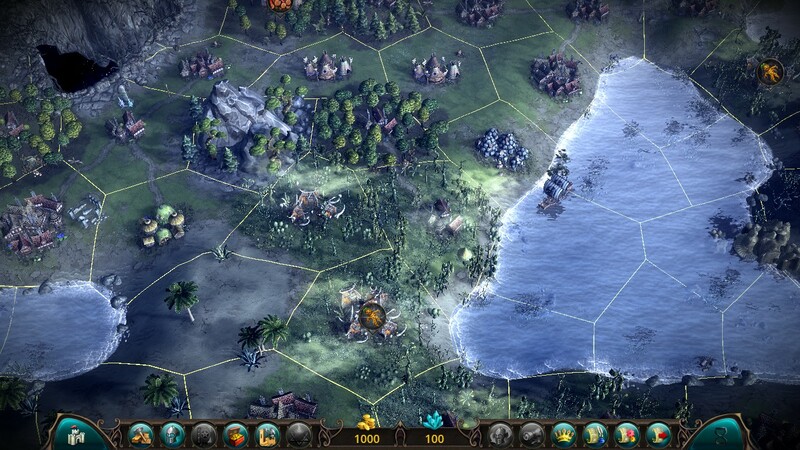 This just scratches the surface as there are layers and layers of construction options available which will grant you access to great things for you settlements, your army and your hero. All your upgrades and skills will be put to good use in battle. You’ll be moving your men on the hexadecimal map taking note of enemy positions and the terrain. You must destroy the opposing side with strength and strategy. Watch out as the AI is very cunning and brutal and will give you a hard time in battle. Parts of the terrain can provide cover or the high ground advantage and you can utilise your magic in battle too. There is the option to auto-resolve the battle but that always makes you miss out on all the fun. There’s even the option of negotiating with the enemy before the battle starts for a peaceful resolution, but remember that can only be done with human armies and that option is not always available. The campaign presents you with many possibilities on how to conquer each shard. Each shard is randomly generated with complexity and strategic choices increasing greatly as you progress. It’s also worth playing again making different morality choices to obtain a different ending. If that ain’t enough you could always play a custom game with up to 16 AI opponents and custom maps. You may also want to give both hotseat and online multiplayer a try and take the fight to your friends. Eador: MotBW has plenty of content that will make your time being a Master a very varied and fun one. The graphics are not an astounding achievement but they still present the world of Eador rather nicely. Each shard looks and feels distinct with features such as snow covered mountains, glistening rivers and endless dunes. It’s actually rather soothing and relaxing to gaze across the soft and serene visuals. These serene visuals are backed by a wonderful fantasy musical soundtrack. Some of the tracks are enchanting, soothing, epical and suit this magical world of Eador remarkably well. Edaor: MotBW has much going for it. It’s challenging, it’s complex, it’s fun and very large in scale. This game is actually a very good effort from an indie developer to add to the turn-based strategy genre. Yet this game is plagued with many problems that prevents it from reaching it’s full potential. The campaign doesn’t seem to carry all your progression with your hero to other shards and you have to start from scratch each time, making the effort a long-winded and repetitive grind. Many of the bugs which caused major problems seem to have been address in a patch recently released by the developers, yet there are still problems such as the awkward character animations which makes the fights looks rather comical. The game seems to have performance issues where the frame rate tanks even when not much is happening on-screen, which doesn’t make sense since it doesn’t look graphically taxing. The user interface for the game is horrendous. It’s a confusing mix-mash of buttons, icons and unless information. The design is ugly and ruins the picturesque visuals. It’s especially difficult to use when building strongholds where it looks cluttered, messy and uninformative. Battles resonate standard clashes and booms but they don’t sound like they have power behind them. Sound effects can make the scene appear awkward, for example the running sound effect is still heard when your soldier slowly strolls towards the enemy and when you get them to run, the sound effect is out of place. It’s also strange to hear peaceful, tranquil music during a ferocious battle which may be either a bug or lack of appropriate soundtracks. Eador: MotBW is very rough around the edges and in dire need of some polishing as there are numerous issues which drag it down. Bugs and poor design choices prevent it from being as polished as it’s other turn-based strategy peers. Even so if you can forgive it’s shortcomings, then this game offers layers upon layers of strategic depth that will have you think like a strategist, charge headlong into battle and conquer the shards with sweet victory. If you’re into turn-based strategy and would like to try something deep, challenging and fun to play, then Eador: MotBW may be something you’d like to add to your collection. This review is based on a digital download copy of the game for the PC provided by Snowbird Games.